As the name suggests, simply smack these drain seals down on the drain to stop the spills from going down in the drain. 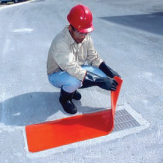 The unique urethane construction allows SMACK DOWNs to deform and seal off most drains, temporarily sealing to any smooth surface. The reinforcing mesh is enclosed between layers of polyurethane for increased durability and resistance to tearing. SMACK DOWNS are a valuable addition to any emergency response plan, spill kit, SPCC or stormwater management program. The non-specified top or bottom makes it a great product to slap down when time is of the essence. It resists oil, water and most aggressive chemicals. When you are done using it, simply wash it off with soap and water. Item # S001 Square-Orange 18" x 18"
Item #S002 Square-Orange 24" x 24"
Item #S003 Square-Orange 36" x 36"
Item #S004 Square-Orange 42" x 42"
Item #S005 Square-Orange 48" x 48"
Item #S006 Square-Orange 54" x 54"
Item #S011 Rectangle-Orange 18" x 58"
Item #S012 Rectangle-Orange 36" x 58"
Item # S052 Square-Clear 18" x 18"
Item #S052 Square-Clear 24" x 24"
Item #S053 Square-Clear 36" x 36"
Item #S054 Square-Clear 42" x 42"
Item #S055 Square-Clear 48" x 48"
Item #S056 Square-Clear 54" x 54"
Item #S058 Rectangle-Clear 18" x 58"
Item #S059 Rectangle-Clear 36" x 58"
All SMACK DOWN stormwater equipment complies with SPCC and NPDES regulations. This optional wall mount storage product makes it easy to grab and go for an extra-quick response time. The Velcro strap makes opening and closing a breeze. It is made of HDPE and will not rust or corrode.